It’s no secret that since the first PowerShell version, Microsoft tries to make it the main administrative tool in Windows. And it mostly succeeds! Using simple examples, we’ll demonstrate PowerShell features of the Get-ADuser cmdlet to search for specific user objects in Active Directory domain and get different information about AD users and their attributes. Note. Earlier to get information about the attributes of AD user accounts, you had to use different tools: ADUC console (including saved AD queries), vbs scripts, dsquery, etc. In PowerShell 2.0, a special module that allows to work with Active Directory appeared — Active Directory Module for Windows PowerShell (announced in Windows Server 2008 R2), it’s able to operate the AD directory objects using special cmdlets. To get information about Active Directory domain users and their properties, there is a cmdlet Get-ADUser. Using the Get-ADUser cmdlet, you can retrieve the value of any attribute of an existing user account in AD. In addition, you can specify different filtering criteria and generate lists of domain users and their attributes. 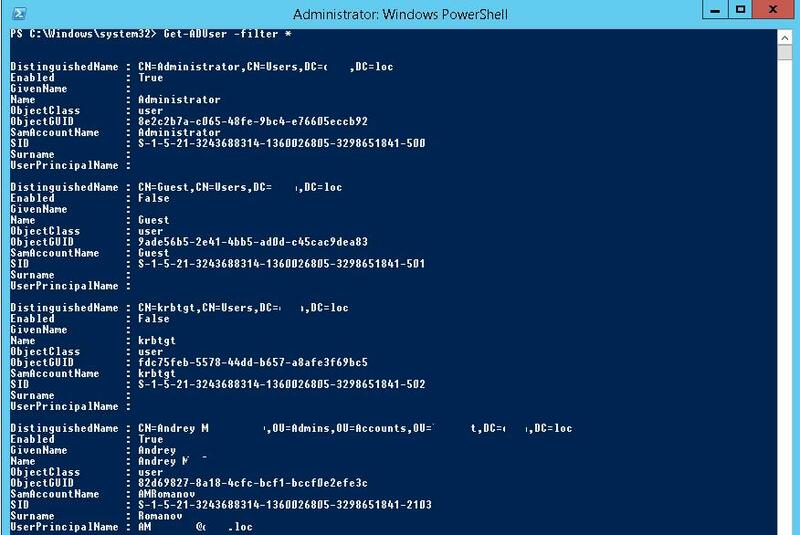 In this example we’ll show how to get information on the last time when user’s password was changed and the password’s expiration date by using Get-ADUser PowerShell cmdlet. Tip. In Windows Server 2012 this step can be skipped since the PowerShell Active Directory Module is enabled by default. 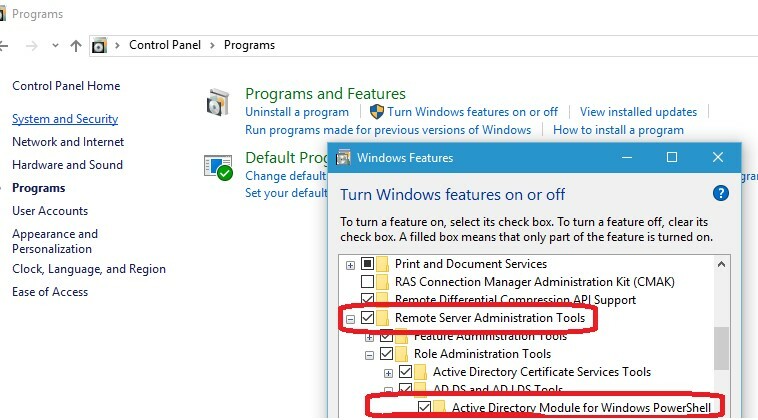 In the Windows 10 or Windows 7 in order to use the Get-AdUser cmdlet you need to install the appropriate version of RSAT and enable the Active Directory Module for Windows PowerShell component in the Control Panel (Programs -> Turn Windows features on or off-> Remote Server Administration Tools -> Role Administration Tools -> AD DS and AD LDS Tools -> AD DS Tools). Important. It is not recommended to run this command in the domains with the large number of accounts, since the domain controller providing the information can be overloaded. The format of the returned list isn’t too convenient, only some basic 10 of the more than 120 attributes and properties of user accounts (DN, SamAccountName, Name, SID, UPN, etc.) are displayed. We also see that the information about the time of the last password change is absent. Also it can be exported to CSV file, which is convenient to import to Excel. (also, using sort-object you can sort the table by PasswordLastSet column, and add the condition where — the user name has to contain the line “Dmitry”.). So you can make a table with any attributes of Active Directory users. To obtain data about Active Directory computers you need to use another cmdlet – Get-ADComputer. To get a list of AD user accounts with a particular characteristic, use the -Filter parameter. As arguments of this parameter, you can specify the value of certain attributes of Active Directory users. Let’s show some more useful options of Active Directory queries using different filters. You can combine them to perform a search to get multiple user AD objects. Task: for the list of accounts that are stored in a text file (one account per line), you need to get the user’s company name from AD and save it to a text csv file (you can easily import this file into Excel). Thanks for this useful information. I’m trying the following script, it works fine on powershell, but when i try to export it to csv, its not readable text in it. Some strings are there only. you are using ft Name, you have to use Select statement for same object properties. Using the “List all active AD accounts”, I want to add password info (password last set, password expired, passwordneverexpires flag set) so I get a list of active AD accounts, logon name, user name and password info. Thanks. With a little tweaking I can now show the columns in the order I want and sort the list by name (actually any column I choose), and I can even export the results. Still a lot to learn but this site is a great resource. thank you very much for this awesome information. I want to export ad users which is not used from last 365 days. And after that wants to delete the same. so pleas share the script separately of both queries.